In 26 years of history, translated into commitment and values based on citizenship and social justice, Febrafite (Brazilian Federation of Associations of State Tax Auditors), a private non-profit entity, defends the interests of tax auditors of state revenues; formulates public policy proposals for the improvement of the National Tax System; and maintains collaboration to increase the competitiveness of the Brazilian economy. 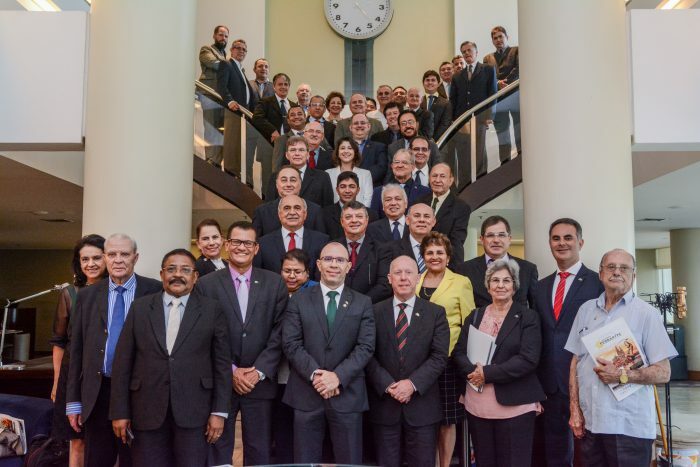 The cornerstone for the creation of the federation was setat the end of 1991 in the general assembly of tax auditors, held in Florianópolis (SC). But it was in March 1992 that the federation began to operate in Asa Norte, in the Federal District, where it is still established today. Throughout its existence, Febrafite has sought to define priorities, to orient its work according to the expectations of its partners and, above all, to develop innovative proposals and solutions to the challenges of a society in constant transformation. Today, Febrafite acts in five main areas: the defense of the rights of more than 30,000 tax auditors of state revenues; the improvement of the tax system; active participation in debates involving the national economy; recognition and dissemination of innovative efforts, such as the National Prize for Fiscal Education; and the provision of services in the areas of health and well-being of associates and their families. In tune with the debate on the tax issue in Brazil and around the world, Febrafite participates in specific forums such as CIAT (Inter-American Center of Tax Administrations) and ENCAT (National Meeting of State Tax Coordinators and Administrators), in addition to promoting exchanges with other international entities, such as APIT (Trade Union Association of Tax and Customs Inspection Professionals) and the Network of Portuguese Language Tax Auditors. Democracy is in the DNA of the entity. In Febrafite, the decision-making process is collective. Every three months, the management meets its Deliberative Council for the approval of actions and positions of the entity. Febrafite gathers 27 Affiliated Associations. The entity represents more than 30 thousand Tax Auditors of State Revenues spread throughout the national territory. It is directed by State auditor career representatives, with a two-year mandate, to act in the defense of the rights and interests of the class, nationally, whether in the administrative or judicial spheres, and may even propose a direct action of unconstitutionality in the Supreme Court of the country (art. 103, IX of the CF). In order to position itself as a strategic collaborator of the affiliated associations, the entity has an area aimed at facilitating access to information regarding the rights of Tax Auditors – in the legal, tax, fiscal, social security and health self-management areas – and in the generation of specialized content and institutional positioning of the entity, aiming todisseminate all the activities developed. For Febrafite, the National Tax System is one of the most important pillars for the country’s economic growth. In this sense, it assumes a leadership role in the National Congress to drive legislative actions to the construction of an environment favorable to the generation of employment and income. Together with affiliated associations and state governments, it defends specific guidelines in the respective legislative assemblies, which confirms its capillarity, political and institutional importance. It works in favor of the ICMS (Tax on the Circulation of Goods and Services), the main source of revenue for federated entities, and defends the compensation of sub-national entities under the Lei Kandir. 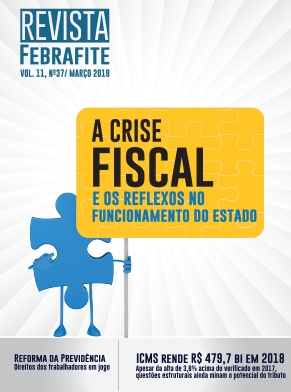 With a wide range analysis, which aims to contribute to the development of a positive forecast for the Brazilian economy, Febrafite conducts studies that aim to raise the pace of Brazilian economic growth. In light of the ideal of social justice, Febrafite has a strategic role in the discussion of proposals to simplify the current Tax System. It also has a strong position regarding the defense of the Federal Pact, the valorization of the tax administration and the national organic law. In another line of action, the entity was one of the creators of Fonacate (Permanent National Forum of Typical State Careers), in March 2013. Today, representing more than one hundred thousand servants of State careers, the entity represents an important trench in defense of essential guidelines for public service, such as, for example, the Public Social Security. Febrafite seeks to strengthen the Tax Administration, with a fairer, more efficient and transparent actuation. The National Prize of Fiscal Education – considered the Oscar’s of Fiscal Citizenship – has the objective of boosting knowledge regarding Fiscal Education in the country and promoting innovative practices and solutions to society’s challenges. Created in 2012 to recognize and disseminate initiatives developed in Brazil by companies, institutions, government agencies and schools, under the theme of the social importance of taxes and the quality of the allocation of public funds. The award is in its seventh edition, summing more than 800 participating projects. The award is supported by the School of Finance Administration (Esaf) and the National Fiscal Education Program (Pnef). In addition to public and private entities, among them: The Ministries of Finance and Education, the Secretariat of Federal Finance of Brazil, the National Council of Finance Policy (Confaz), the Inter-American Center of Tax Administrations (CIAT), the National Meeting of State Tax Coordinators and Administrators (Encat), the National OAB and the National Association of Members of the Public Prosecutor’s Office (Conamp). The prize, which annually awards the best practices in tax education, with visibility for the social importance of taxes and their correct application, is divided into three categories. Schools, Institutions and Printing Professionals. Coordinated by the Directorate of Fiscal Studies, the third edition of the publication ” Fiscal Reform Proposal – Citizenship and Social Justice” – was launched this year. Among the innovations of this edition, the following are proposed: the merger of the ISS with the ICMS, configuring a VAT, of competence of the States; the creation of a National Council of Tax Administration (Conat), an organ integrated by the taxes administrations of the three federative entities, with the purpose of unifying the understanding about taxes and harmonizing the rules referring to the instrumental legal duties, diminishing also the costs of the companies; the valuation of good taxpayers aiming at introducing a new paradigm of tax office-contributor relationship; the modernization of the taxation on goods and personalized services – the VAT-P – with the criterion of financial exoneration, aimed at low-income consumers, through the return of the equivalent of taxation on consumption taking advantage of the technology of the single registry, a successful experience in Brazil for almost two decades. The national board of the Febrafite delivered to the state governments candidates, in August 2018, a study with 21 short-term measures to optimize tax collection, without the need for approval of proposed amendments to the Constitution.